Speaking about this topic we cannot omit one of the most legendary bands of traditional jazz-Traditional club (later renamed to the Revival Jazz Band, T R Band) in Bratislava. The following performers were active in the band: I. Celko, P. Moritz, B. Boska, K. Zavodny, M. Vasica, F. Karnok, V. Vizar, P. Molnar, S. Popluhar and K. Suchan. 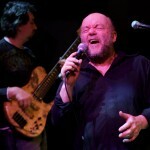 Prominent vocal performers of Czechoslovak jazz Peter Lipa and Jana Kocianova cooperated as well. 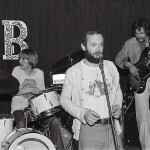 Since the 1970s modern jazz in Bratislava partly lost its developmental dynamics and it did not have appropriate support from institutions nor from the audience. 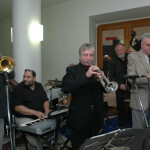 Jazz musicians therefore lef to the Czech Republic and abroad. Since 1975 the couple L. Gerhardt and K. Ondrejicka have acquired younger colleagues for concert activities such as D. Huscava, L. Tamaskovic, J. Brisuda, A. Jaro, M. Korinek, I Mozi, J. Dome, P. Kozma, J. Sosoka, C. Zelenak, J. Rozsival and others. Among important personalities of instrumental jazz in the 1970s we can find other phenomenal jazz performers: the pianist Gabriel Jonas, “free jazzman” and singing teacher Frantisek Tugenlieb, “synthetic” Peter Breiner, wind virtuosos Dusan Huscava, Juraj Lehotsky and Frantisek Karnok and prominent bandleaders of large jazz orchestras Vladimir Valovic and Pavol Zajacek. Bratislavské jazzové dni – Bratislava jazz days (BJD) is a festival for jazz fans. They started in 1975 and have been very populat until today. Prominent Slovak and international jazz parformers meet there (Stanley Clarke, Chick Corea, Herbie Hancock, John McLaughlin, Al Di Meola, Marcus Miller, Jean Luc Ponty and many others). This event belongs to the organizational soul of Peter Lipa. The Jazzový festival – Jazz festival in Žilina is also winning its fans. The zero year of the festival was the year 1986. Currently there are festivals held annually in Prešov, Košice, Nitra, Banská Bystrica and elsewhere. The work of jazz and student clubs throughout Slovakia plays an irreplaceable role in bringing up new jazz personalities and listeners.